Confession: I have a slight obsession with Mexican food. Well, maybe more than a "slight" obsession. From tacos to tequila, enchiladas and elote, there's nothing I crave more. Is it too much to have queso and tacos for breakfast, lunch, and dinner? As I was driving through Midtown, I almost swerved off the road when I saw that nada was opening in Nashville as all of my friends from Cinci have been raving about this restaurant for quite some time. In 2007, the Boca Restaurant Group opened the first location in Cincinnati and have expanded this Mexican empire with locations in Columbus and Indianapolis. Nashville serves as their fourth location with a fifth scheduled to open in N. Bethesda. nada is a casual establishment serving Mexican food with a contemporary flair. As you walk in the restaurant, your eyes are immediately drawn to the bold tile design, the grandiose bar and impressive selection of spirits. Did I mention their tequila selection? Yeah, hope you took an uber. nada: Isn't this bar impressive? First things first, let's talk cocktails. You can't have a proper Mexican feast without margaritas. Am I right? While perusing the cocktail menu, several drinks caught my eye. In an attempt not to be completely basic, I decided to start with the Chile-Mango Margarita. I wanted to kick it up a notch and this drink certainly did that. The habanero and ancho chile salt rim certainly had me catching my breath but was exactly what I was looking for. Caught off guard by the consistency, I sipped this drink slowly as it was much thicker than I had imagined. If margs aren't your thing, which I can't even fathom, nada offers an extensive listing of cervezas and wine. You can't step foot in a Mexican joint and NOT partake in chips, salsa, and queso. After all, queso is king! If I ordered nothing else at nada other than those three items, I would be completely content. I'll let you in on a little secret- nada's queso may be the best in Nashville. nada offers a distinctive selection of salsas where chips are almost secondary. Diners have the choice of three salsas: Fire Roasted Tomato Ancho, Serrano Salsa Verde, and Habanero "Kreeper" Salsa. Out of the three selections, I found myself leaning towards the Serrano Salsa Verde as it was refreshing and provided the perfect amount of spice. The "kreeper" salsa had an interesting flavor profile as it appears so innocent at first with notes of apple cider vinegar but then gives your taste buds a swift kick as it finishes. Words can't do this queso justice, so I will let the video speak for itself. Queso Gringo is served with smoked gouda, black bean puree, rajas, pico de gallo and habanero "kreeper" salsa. You need to order it. Period. Let's tackle the tacos! When it came time to taco 'bout our entree decisions, we had to solicit the advice of our server. There were so many options and I wanted to make sure we didn't over order. One thing to note, nada's tacos are SMALL and are just a bit bigger than the palm of your hand (and no that doesn't include your fingers). If you are hungry or borderline hangry, order at least three tacos and maybe even a side. With your favorite guy? Yeah, steer him towards ordering at least 4. 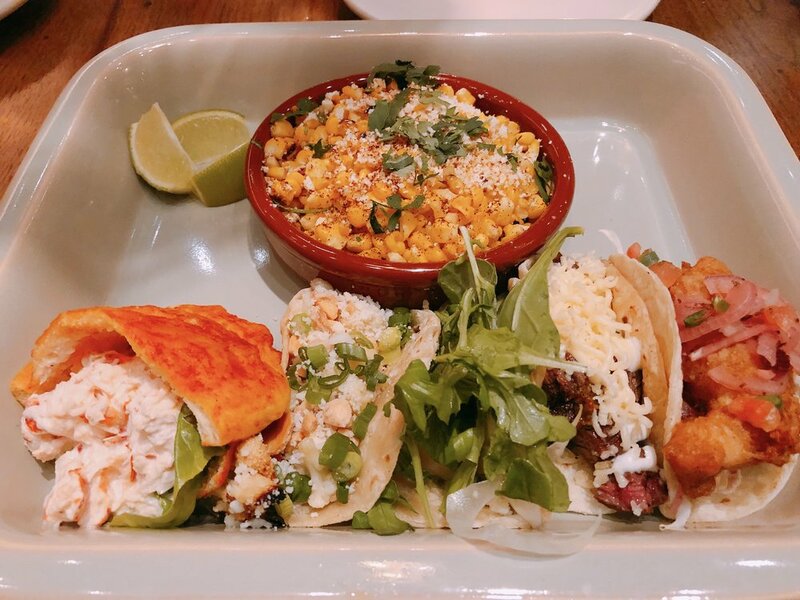 Relying on our server's expertise, we ordered the following tacos from left to right ( ignore the Bolsas, we will get to that in a second) Grilled Shrimp, Caramelized Cauliflower, Carne Asada and Baja Fish. While all of the tacos were outstanding, the clear victor was the Caramelized Cauliflower. Perhaps it was the confit garlic goat cheese or the Marcona almonds, but this gave me something to taco 'bout. Bolsas. Have you guys heard of these because it was a new one for me. Our server insisted that this was one of the best things on the menu, so we had to give it a shot. Featured far left (above), bolsas are fried tortillas stuffed with filling. In this case, we ordered the Lobster Bolsas which was filled with Maine lobster, Old Bay aioli and bibb lettuce. It reminded me very much of a pita. While I thoroughly enjoyed the lobster, I think I would opt for something different next time as the enchiladas caught my eye. nada offers a variety of sides, however, I was immediately drawn to the Wood-Grilled Corn Elote. As if I even need to explain why after looking at this picture. Served with chili aioli, cotija, and lime, this dish was the perfect compliment to our assortment of tacos. I loved the fact that it was off the cob because we all know how messy that can be! Rest assured not one kernel was left behind during this blog research. As we say goodbye to the savory, it's now time to introduce you to the sweeter portion of our evening and believe me, you will want to stick around for this. To be completely honest, I rarely have dessert at a Mexican restaurant. It's not because I don't want to, it's because I am usually stuffed with eating so many chips and salsa. But I had to reel it in a bit during this visit because of the rumblings I had heard about dessert. nada serves four different desserts and of course, I couldn't just try one. Featured below from left to right: Butterscotch Flan, Chocolate Terrine, and Churros. Trying to choose a favorite is almost impossible because each is so different and delicious in their own way. If you are in the mood for something light and fun, I would recommend the Churros. They are served warm and rolled in cinnamon and sugar. nada serves these little doughnuts with a side of caramel dipping sauce. Out of this world! Butterscotch Flan is perfect for the person who wants something sweet but not overly decadent. I thoroughly enjoyed this dish and the fact that it was topped with coconut cream certainly helped! Finally, the Chocolate Terrine is the perfect dish for the chocoholic in your life. Not only is the dish drizzled with olive oil and topped with sea salt but each bite has a tiny bit of spice that plays against the sweetness of the chocolate. Absolutely a bite to savor. From the queso gringo to the butterscotch flan, every bite left a smile on my face. But, don't take my word for it. Check out nada's menu here. Of course, you're drooling. Word to the wise, make reservations. They turned away at least 40 parties the night that I had dinner there and you definitely don't want that to happen.